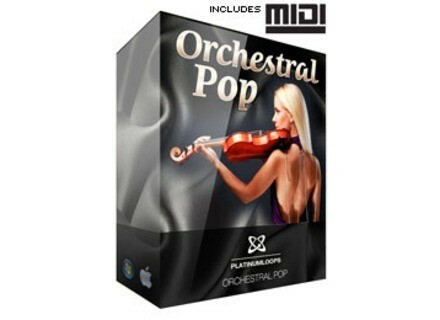 Orchestral Pop V1 - Audio & MIDI Loops, Other CD & Sound Bank from Platinum Loops. Orchestral Pop Volume 1 gives you modern orchestral loops to suit a wide range of production needs. 10 construction kits include full MIDI arrangements and audio stems of each orchestral instrument used in the arrangement. This is designed to give you total control to remix or even replace the original instruments with your own sounds. From cinematic epics to soft and motivational backgrounds. Whether you are producing gangsta rap or music beds for car commercials this loop pack adds a touch of class to your productions with minimal effort. With 140 audio loops in three different formats (that's 420 audio files) and the full MIDI sequences, you can arrange, re-arrange, remix and replace any instrument with any virtual instrument that your DAW provides. Just drag and drop the MIDI files for each arrangement into a midi track in your DAW (Ableton, Logic, Cubase, Reason etc) and you'll see the raw midi sequences ready for you to play with. Not interested in MIDI? That's OK, just drag the audio loops on to your audio tracks and start putting together your arrangement. We even included fully mixed audio examples of what you can do when you put it all together. Tempos range from 99 bpm to 125 bpm.